Volkswagen Up 1.0 Look up! 5dr 6 MONTHS WARRANTY FREE ! Nissan Qashqai 1.6 N-TEC+ 2WD 5dr 6 MONTHS WARRANTY FREE ! Peugeot 3008 1.6 e-HDi FAP Active EGC 5dr 6 MONTHS WARRANTY FREE ! Seat Leon 2.0 TDI FR (s/s) 5dr 6 MONTHS WARRANTY FREE ! MG MG3 1.5 VTi-TECH 3Style+ (s/s) 5dr 1st Service FREE ! Vauxhall Adam 1.0 i ecoFLEX SLAM (s/s) 3dr FULL TANK OF FUEL INCLUDED ! Nissan Micra 1.2 Acenta 5dr 6 MONTHS WARRANTY FREE ! 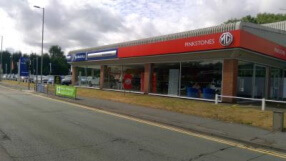 Pinkstones Used Car Centre offer new MGs and Subarus cars as well as used cars. They offer full servicing, MOTs, repairs, bodywork and parts at their centre. The can arrange finance and offer warranties.